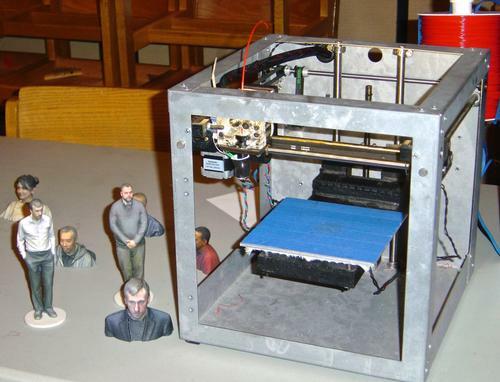 In honor of Philly Tech week last month, Northeast Regional Library hosted their first ever TechXpo where attendees could get a first-hand look at some of the latest technology in action including 3D printing and iPad-created stop-motion animation. Both NRI 3DLab and the Chocolate Press were on hand to demonstrate how 3D print technology can be used in different ways. Center City-based NRI uses 3D printers to create personalized 3D action figures and selfies, while the Chocolate Press 3D prints personalized chocolate molds and cookie cutters. Visitors to the Chocolate Press table enjoyed getting creative in the design-your-own cookie cutter contest and tasting the yummy free chocolate samples. Members of the Free Library’s MakerJawn program were also on hand to teach children of all ages how to use iPads to create stop motion animation. It was pretty cool to witness a 6-year-old make their own animated short. The Hactory, a self-proclaimed group of hackers, artists, and technology enthusiasts who repurpose technology to create art, provided a computer jewelry maker table where makers could choose among recycled computer parts and electronics along with beads and findings to fashion their own unique piece of wearable art. Their six-foot-tall paint pendulum constructed entirely from PVC pipe was also a popular attraction and kids could try their hand drip painting Jackson Pollack style. 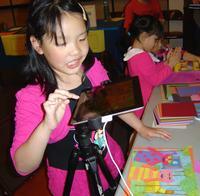 A young attendee uses an iPad to create images for stop motion animation. Samples of 3D printed figurines made with the help of NRI 3DLab. 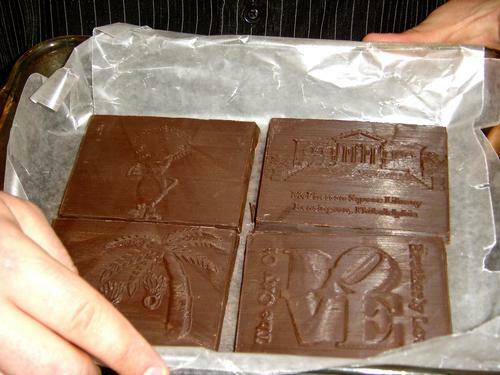 The Chocolate Press displays chocolate made from personalized 3D printed molds.